Let’s dive directly into our line-up of range bags. You can find the purchasing tips at the end of the article. 2.1 Why a range bag? 2.2 Which kind of range bag? 2.3 What to put in a range bag? What impresses us the most on the Maxpedition Compact Range Bag is the high quality of craftsmanship, which gives you a long lasting range bag that holds up the intense use for quite some time. However, it’s not only the heavy duty built of the range bag that helps it stand out from the crowd, it’s also the material is made of. The range bag is finished with a triple coat of polyurethane that gives it water resistance. The final coat of DuPont Teflon fabric Protector gives you a bag that repels the elements. The YKK zippers fit the strong build and the high quality materials and the zippers are tough, ready for the heavy-duty use. The straps are also a great feature on the bag as they are made of military grade nylon Webbing. The same material is used for the handles and the modular attachment points, sustaining the strong built of the range bag. The Duraflex buckles and the hardware are sure tough and resistant, so there’s no way you can doubt the durability of the features on the bag. The buckles are silent, which is so important when you’re out there on a mission. Going over the details, we notice the large and unseamed panels made with 1000Denier Nylon. The attention to the small details is impressive and each stress point is reinforced thoroughly with composite thread. There are no unnecessary seams or polyester parts and the bag becomes lightweight, yet so durable. As for the storing options, we see the 4 spacious exterior zippered pouches and pockets and the big, large interior compartment. 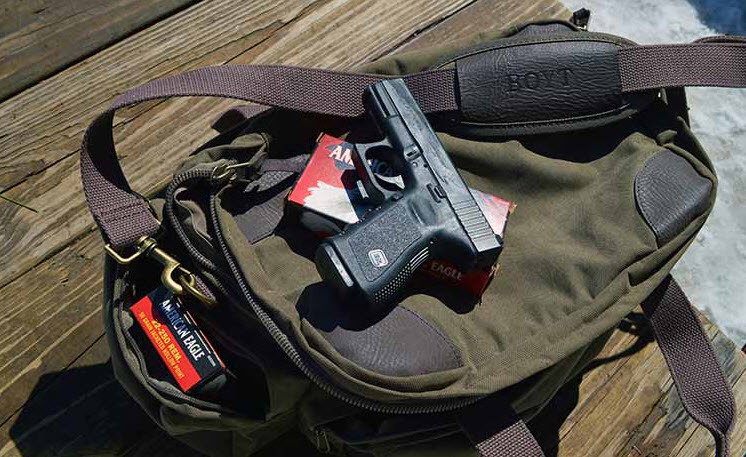 We like the range bag as it versatile and subtle and its removable tote fits most handguns. 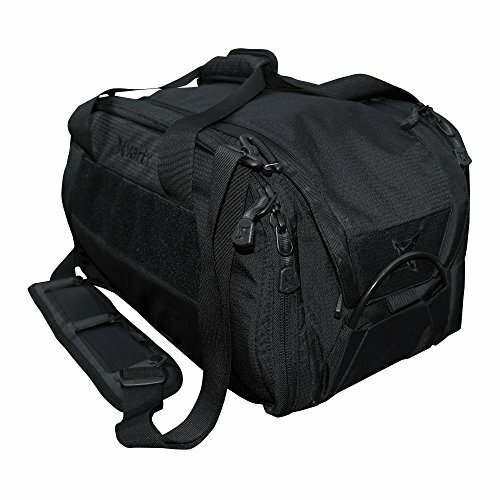 You may use the bag for several firearms and accessories and you have a place to store your ammo as well. The abrasion-resistant ballistic nylon fabric makes the bag lightweight, whereas the padded compartments store safely your weapons, with minimal risk for scratching. The paracord zipper pulls are so useful for easier use and the zippers run so smooth. The strap is well padded for more comfort and the bag is versatile and dependable. The range bag has a solid, rigid built and holds its shape for quite some time. It’s easy to take care of it as the material is treated with Teflon for water and grime resistance. You should avoid machine washing or use of detergent and bleach. You only need to wipe it down with a damp cloth from time to time, letting it dry naturally. Nevertheless, for its amazing build, high quality materials and functionality when out on the field, the range bag is a great investment for any gun owner. 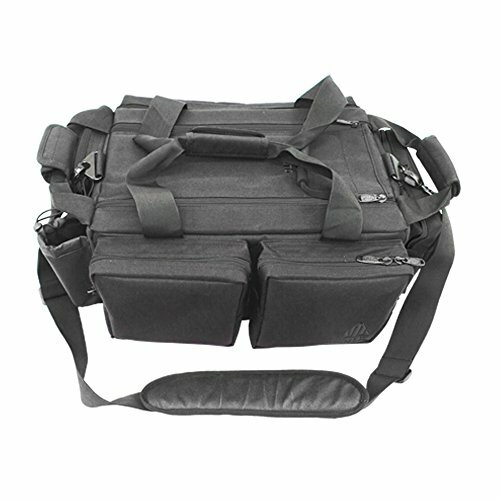 –> Check Out the Latest Pricing and Reviews on the Maxpedition Compact Range Bag at Amazon. Some of us out there really see the Vertx A-Range Bag as a near perfectly designed range bag and you need to read on to get a better understanding of why I’m saying this. You may also check out the Vertx B Range Bag. The bag is made with 100% nylon that can take the heavy-duty use, but it’s definitely the design that makes the bag stand out from so many models. You actually get plenty of options to organize your gear and you can easily fit, for instance 2 full size handguns in the side compartment, two compacts in the side pockets of the upper deck and two full size handguns in the rugs in the main compartment. The ammunition compartment may store a dozen of 30-round AR mags or boxes of ammo. 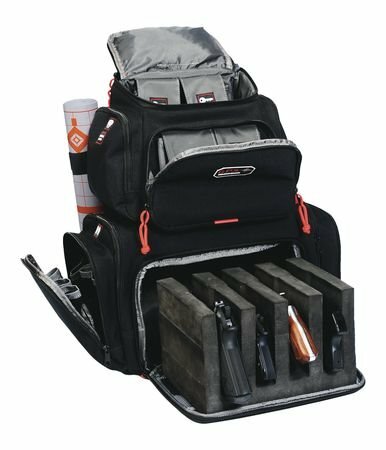 The bag features a compartmented garage deck with pullout drawers so that you may hold your ammo and accessories separate, yet easy at access. The dual drawers have pull handle and also mesh-bottom drawstring bags for storing your smaller items. The brass store is durable and doesn’t pick up dirt or grease easily. The lay flat front opening presents a surface that is hook compatible and may serve you as a cleaning rug as well. The bag features attachment points on the shoulder straps and hook compatible surfaces in every compartment. It has a cable affixed that may work with your favorite locking cable. The pull out compartments, the shelf type system really make the range bag a great choice to consider. The steel coil that loops under the bag for security if you want to apply a lock is an important detail and the outside pockets are well padded. All things considered, for the ability to organize so well your gear and to be so reliable, the range bag is a good investment to make. –> Check Out the Latest Pricing and Reviews on the Vertx A Range Bag at Amazon. When you want to use as a range bag, a range backpack, you can start with this G.P.S. Handgunner Backpack. The backpack gives you so much space for your items, that you keep on loading it… And you discover that the fully loaded pack is too heavy. The backpack doesn’t fit a larger revolver. But, if you want to have a range backpack, this is a great buy for sure. –> Check Out the Latest Pricing and Reviews on the G.P.S. 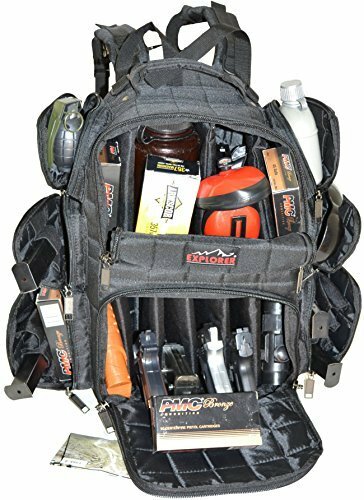 Handgunner Bag at Amazon. 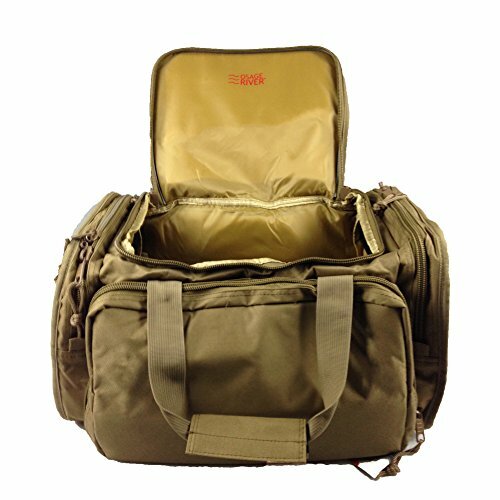 You may found yourself mislead by the Osage River Tactical Shooting Gun Range Bag, as the bag does look like a gym bag from the outside, but sure doesn’t disappoint with its great gunning look on the inside. The bag is spacious and gives you plenty of compartments, increasing your options to organize and fit your accessories. You may actually fit in there small to mid-size handguns and the pistol pouches are great. You may also find space for your ammo and your accessories as well. You get no less than 9 different storage compartments, so the bag is good for organizing your items. It’s main compartment is dividable, whereas the five zippered compartments increase the storage options. The two pistol pouches are easy to remove and you may combine it for other storage configurations. The bag features two vertical dividers so you may organize the main compartment according to your needs and wants. The outer compartments include 10 magazine/accessory pockets, so you may find a place for every single item you have. The bag is made with heavy-duty 600D ballistic nylon so it takes the intense use rather well. The zippers match the durable materials, running and easy to open even when hand gloved. Each of the zippers feature locking rings and the zipper pulls are covered with metal. The bag comes with handle and shoulder strap so it’s easy to carry around. It doesn’t matter where you go or how you’re going to wear it, the bag is ready. Every pocket and pouch of the bag is well padded so all of your items are protected. None of your gear rubs or bangs against one another. All by one are double zippered also. The rugged build and the good design complete the description of a bag that is made here at home, in our USA. The minor cons don’t count much though as the bag is way too spacious and well organized, being ready for the heavy-duty use. In addition, this definitely counts a lot more for one of the best range bags like the Osage River bag. –> Check Out the Latest Pricing and Reviews on the Osage River Range Bag at Amazon. When you take a look at the Backpack + Range Bag with Large Padded Deluxe Tactical Divider and 9 Clip Mag Holder – Rangemaster Gear Bag Explorer, versatility is first thing to pop your mind. The backpack is an interesting bag to carry your shooting equipment, to say the least. Once you opened the side flap, you get to see the 5 internal handgun and magazine storage rooms that are protected by their own, lockable compartments. The backpack also features exterior pockets that are zippered, whereas the top section is great to organize more ammo, due to the rigid internal frame. The elastic loops store rolled targets and the backpack also comes with a pullout rain cover that protects your gear when raining. The backpack also comes with a very large compartment and two elastic at back for holding more small gear. You may also notice the extra compartment at the lower pocket lid and the heavy-duty padded nylon material. If we talk about the heavy-duty material, we also need to talk about the reinforced double-stitched nylon seaming, the coil zipper and the molded nylon buckles. We have to mention the large rear water hydration bladder pocket and the three external pockets at left. We like a lot the top-mounted compression straps that balance well the weight and load, giving stability. The backpack is very modular and gives you the chance to better organize your gear. Well-made, highly customizable, and heavy duty, the backpack is actually very easy to handle even when fully loaded. It’s easy to put it together and it has a durability feel to it. For its quality, heavy-duty built and ability to be customized, the backpack is a great option for you and your gear. –> Check Out the Latest Pricing and Reviews on this Range Bag at Amazon. Built with high quality, strong synthetic fabric, the UTG All-in-1 Ultimate Range Competition Bag is ready to take not only the common tasks, but also the more challenging conditions. The bag is very well made and comes with a good design so it stores and organizes your gear nice and easy. It gives you plenty of room and quite a versatile design for storage. Taking a closer look at the bag lets us see the pullout bag with the adjustable dividers, the 2 removable pistol cases and the two brass bags that come with tough handles and a shoulder strap as well. The bag isn’t just portable, but also versatile and easy to use, no matter the conditions of transportation. The additional shoulder strap is also adjustable and comes with a strong D-ring and a non-slip grip texture, whereas the wrap-around carry handles are reinforced for durability and flexible carry. The open top of the bag presents a dual zipper closer so you get easy access to the main compartment. The main compartment features 2 inside wall pockets, giving you even more room for storage. The external pockets offer more options and space for storage of smaller items and the padded front pocket comes with 10 elastic loops to hold your other accessories and it’s also fully open-able. The opposite side padded front pocket has a gun cleaning mat that is easy to detach and 8 pistol mag pouches as well. The side compartments are zippered and give you easy access to your ammo. Each of them as a clear ID pocket for faster identification. The stitching is reinforces and the zippers are heavy-duty. The bag is well made and is larger than it looks. Despite the minor flaws, the range bag is still a dependable choice as it gives plenty of space and good organization options for your gear. –> Check Out the Latest Pricing and Reviews on UTG All-in-1 Range Bag at Amazon. 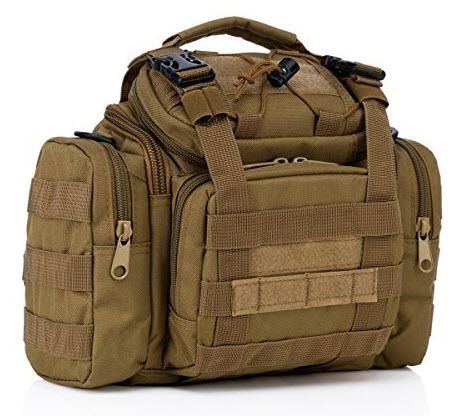 With almost $50 you can buy an amazingly sturdy, well-built range bag with many organizational options like the Explorer Tactical Range Ready Bag. There are no zippers for the removable pouches in the side compartments. As one can see, this qualifies for a great range bag anytime. –> Check Out the Latest Pricing and Reviews on the Explorer Range Bag at Amazon. When your budget is limited but you still expect to get a good range bag, get yourself the GunMate Range Bag with Removable Hook and Loop Dividers. All in all, you get a good, sturdy and well-built range bag, for a very good price. 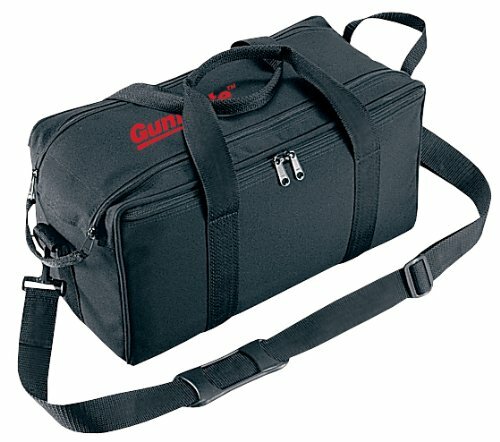 –> Check Out the Latest Pricing and Reviews on the GunMate Range Bag at Amazon. If your needs are larger and you want to carry around 12 pistols in your range bag, give it a go with the Explorer Tactical 12 Pistol Padded Gun and Gear Bag. For the organization and sturdiness this range bag gives you, it’s a great buy on any given day. –> Check Out the Latest Pricing and Reviews on the Explorer Tactical 12 Bag at Amazon. 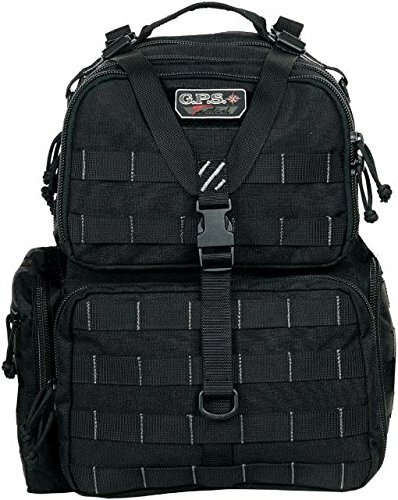 Another great backpack made specifically for the range is the G.P.S. Tactical Range Backpack. Along with the comfort and easy access to everything that it offers, this pack comes with many other good features. The removable compartments don’t look long lasting as the rest of the pack. Don’t let the price scare you away, as for the money you pay you get a great range backpack that’s worth every single penny, in both build and functionality. –> Check Out the Latest Pricing and Reviews on the G.P.S. 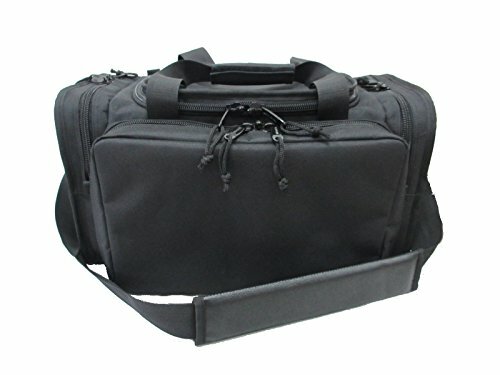 Tactical Range Bag at Amazon. Going shopping on a fixed budget is not picnic, but it doesn’t mean you go back home empty handed. As long as you’re aware of its limitations, you can definitely give it a try with the G4Free Modular Range Bag that gives you decent space for your gun and gear, for a very good price. The bag is made of high-density polyester fabric and manages to take the intense use for a good amount of time. A rather lightweight bag presents a 3-way design. You may actually wear it as shoulder bag, waist pouch or handbag, according to your needs or wants in a specific time. Therefore, you shouldn’t worry about its versatility nor portability. The bag may be rather small, but comes with plenty of storage options, giving you the chance for better organization of your guns and ammo. It features a main compartment, top compartments and front compartments so it’s quite impossible to lose something inside. The bag also presents two side pockets and comes with durable zippers. The bag has a sturdy construction and the zippers run great. It has also two Molle straps on the back for attaching other various items. The bag has a compact shape and it’s easy to use and to carry around. The shoulder strap is adjustable and well padded. Small, lightweight and ready to take some ranging experiences, the bag is a fair option when you don’t want to pay the extra buck. Nevertheless, for a small price, you get a pretty good range bag that fits plenty of your gear, in a nice, organized way. If you’re on the hunt for a range bag, you must probably know by now that it needs to meet some criteria so you can name it a “range bag”. A range bag has to be tough and sturdy so that it can take any wear and abrasion, from inside and outside at the same time. It needs to be strongly built so that it can take the heavy weight from the firearms and ammunition that you carry. A good range bag gives you also good volume so that it can fit many items, going from your pistol/s and ammo, to some medications and small gear items. The best range bag has also a different compartment for your pistol/s, so a good organization is important. Which kind of range bag? Typically, there are three main categories of bags that qualify as “range bags”. The first one is, of course, the specific range bag. They are strongly built, are heavy duty and give you plenty of capacity, many various pockets for you to organize your various items. 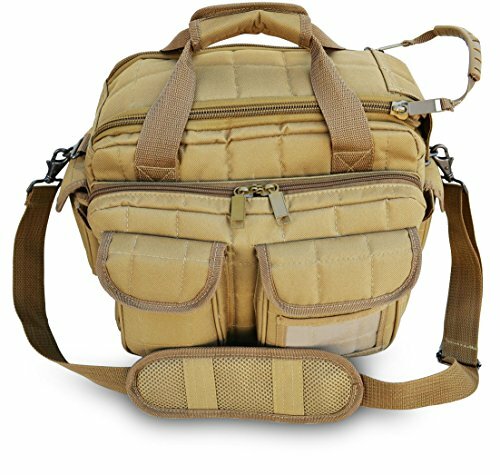 This is the best choice for a range bag as it gives you compartments especially designed and built for ammo, pistols and any other gun-related items that you might need. The main downside for the range bag is that… it looks like a range bag all the time, no matter where you take it. For some, looks don’t matter, but there are some that wish their bag not to show everyone what they carry. Of course, it’s legal to carry and use a gun in some situations, but there’s no subtle thing about it when you carry a range bag. The easiest solution for carrying a gun is a backpack. It gives you plenty of capacity for all your items and quite good organization and some padding, in the case of a good backpack, but this option has its downsides. A backpack may be too large for your guns and the padding might not be enough to protect your gear. A combination of the two unspecific bags is the “laptop backpack” which gives you the padded compartment for the gun and a good organization at the same time. You can also find a “covert-carry” backpack that actually offers a designated compartment for your pistol. In the end, you can make an effort and transform any backpack into a range bag. You just need some space, organization and padding to get a functional range bag. 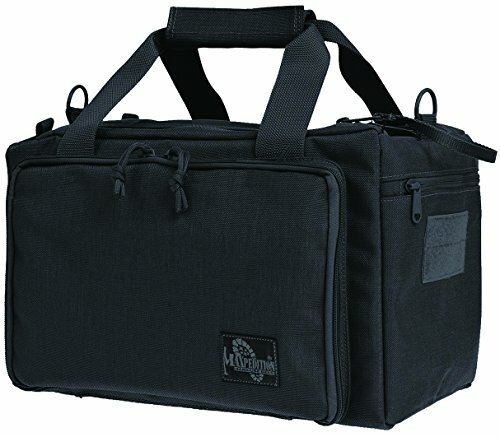 What to put in a range bag? Apart from the things that are a completely personal option to carry in your range bag, some things should never miss from any range bag. The EPIK (Emergency Personal Injury Kit) and rapid-application tourniquet are a must have any time. Of course, this implies to also know how to use these in case of emergency. Never forget your eye and ear protection and a cloth to wipe down your firearm and magazines after practice, ammunition. A notebook and a pen are also important when you want to keep track of your performances just as well. Some put in the range bag also a cleaning kit and some lube for a better function of their guns. You can also carry useful tools, bandages for minor cuts and a rolls of masking tape wouldn’t hurt either as you can tap up targets with it. Take a good look at your needs and preferences when you go shopping for a range bag. No matter if you go for a subtle range bag (that doesn’t look like one) or a professional bag, keep in mind that it needs to be sturdy with great built and organizational options and be comfortable at the same time.